Sarah Mehle (Patricia Singleton/Patti Sing), Margaret Matejcek (Taylor Tarrington/Tum Tum), and Blanka Melbostad (Barbara O. Peoples/Bow Peep) in The Mikado, The Gilbert & Sullivan Very Light Opera Company, 2019. Photo: Stephen Hage. The Gilbert and Sullivan Very Light Opera Company (GSVLOC) at The Howard Conn Fine Arts Center in Minneapolis presented an updated, re-imagined production of The Mikado. I have not had the opportunity to see a live Gilbert and Sullivan production before, but I am slightly familiar with the works and genres. GSVLOC certainly delivers and provided a joyful evening, that was remiss of racism and yellow-face that is ingrained in the work. The production was expertly directed and rewritten by Rick Shiomi. Mr. Shiomi changed main characters names (Yum-Yum to Tum-Tum for Taylor and Nanki-Poo to Frankie-Poo) and the setting to Victorian England. 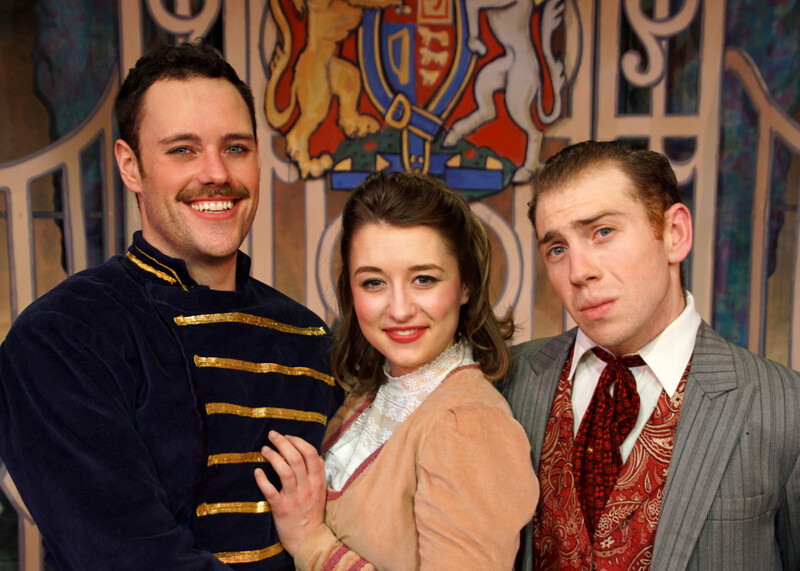 Anthony Rohr Franklyn (Pool of Hanover/Frankie-Poo), Margaret Matejcek (Taylor Tarrington/Tum Tum), and Tyus Beeson (Coleman Coe/Co Co)in The Mikado, The Gilbert & Sullivan Very Light Opera Company, 2019. Photo: Stephen Hage. The standout of the principles was Anthony Rohr as Frankie-Poo. He had a bright confidant tenor that was showcased in his first act aria. His opposite was Margaret Matejcek as Tum-Tum was charming in her naivete. Coco was energetically played by Tyus Beeson. His character’s famous “list song” got the most laughs of the night with topical political commentary including obstruction hearings, the orange baby that was caught kissing Stormy Daniels, etc. Kate Shaw (also known as Katishka) was sung by Lara Trujillo. The costumes were stock G&S: white dresses for the ladies chorus and three piece suits for men. My favorite was the three little maids’ blue schoolgirls outfits with their croquet sticks. The highlights of Gilbert and Sullivan repertoire is the chorus/ensemble scenes, and GSVLOC certainly does the job right; the chorus had very strong voices and charming choreography. 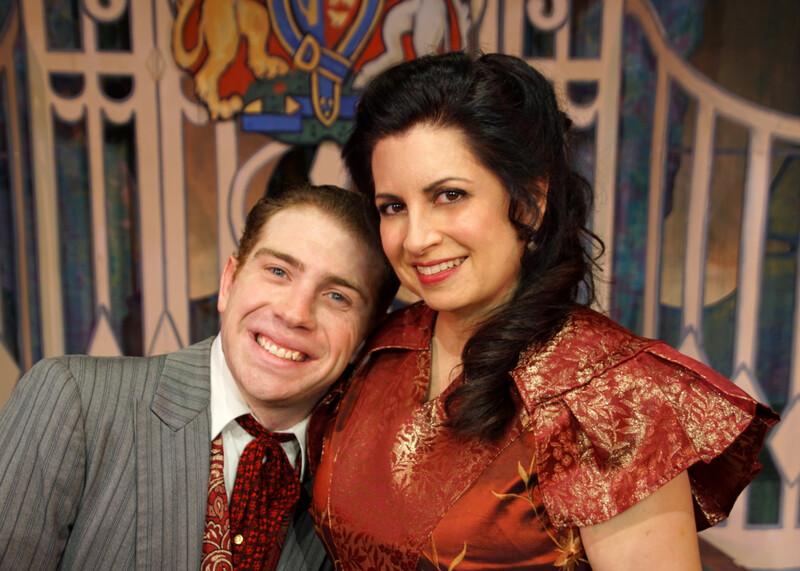 Tyus Beeson (Coleman Coe/Co-Co) and Lara Trujillo Lady (Katherine Shaw/Katy Shaw) in The Mikado, The Gilbert & Sullivan Very Light Opera Company, 2019. Photo: Stephen Hage. It was interesting to hear the stereotypical “Oriental” sounds that Sullivan infused into the score whilst the cast sang and danced in Edwardian/Victorian garb. (Though Kate Shaw had a kimono-style dress on in the second act, which was beautiful and I assume a nod of cultural appreciation.) Obviously necessary as this updated take on the production is in 2019, it also brings out strengths in the performers and really demands more from them. The comedy of this silly, convoluted plot is no longer dependent on racist stereotypes, imagery and impersonations; instead it forces the players step up to the plate and be imaginative. Mr. Shiomi did just that, and got a nuanced performance from the cast. Some G&S purists may disagree. I certainly look forward to their next production of Ruddigore in the spring of 2020, GSVLOC does the hard work of keeping light operetta alive in the Twin Cities!